It's a really good thing I went shopping for holiday accoutrements last week. The mall would be a horrible place to be the nearer we get to the Big Day, especially since I seem to have developed the plague*. You'll be pleased to note that my holiday decor has progressed past one Santa towel in the bathroom. 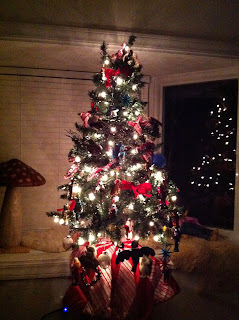 We even got the tree up and festooned with all the tchotkes I bought at Sears! I'm not quite decking the halls with boughs of holly, but but for me, this is festive. We've been lighting Hanukkah candles every night before we plug in the tree, very multicultural and festive. No, Bob is not the unabomber. Thanks for asking. I really like how well the ornaments I bought from Sears blend in with the few that we already had. They have kind of a vintage vibe and seem very well made. Only one glass ornament broke during Operation Tree Decoration and it was entirely my fault. RIP peppermint candy, RIP. As much as I like all of the decorative decorations (I know, that sounds weird), I think my favorite purchase was the multipack of wintery trees meant for dioramas or trainsets. The kids have been moving them all over the house, making little tableaux of Polly Pockets and Star Wars guys. Totally the reason for the season, y'all. *Well, it's probably just a cold or the flu but I like to be dramatic. Not least because I had a bad reaction to platelet donation on Monday that made my arm swell up and turn all sorts of freaky inhuman colors. It's back into the realm of black and blue but still looks revolting. Jasper is excited because he thinks I might be turning into a zombie. Sigh. I hope you're well beyond where I am for holiday preparedness but if not, remember you can avoid the crowds and shop from the comfort of your own home any time, day or night at sears.com/holidayshop. If you need extra-added help stoking your holiday spirit, the Sears Cheer Tree can help with hints and stories from their Holiday Cheer Squad and a Cheer Tree mosaic that you can add your own holiday decorating photos to and search for special offers and deals. You can even order fresh live Christmas trees, wreaths and greenery online! Love how festive it looks! Great photos of your tree!